One aspect of canine health that can be easy to overlook is the paws. We put on shoes every day to protect our feet, so why don’t we take the same care in protecting Fido’s paws? Your dog’s paws need just as much care and caution as the rest of his body. They are constantly being introduced to new surfaces and bacteria, which can result in cracking, burning, frostbite or injury. Although your dog’s paws are sturdy, they are not invincible. It is important to take the appropriate steps throughout the year to help prevent your dog from encountering paw problems. Your veterinarian will have stories to share with you, cautioning you about where you take your pet to walk. Avoid parking lots full of oil and antifreeze. Large rocks and even small pebbles can pose hazards to your dog’s paws. Lush grass and soft sand are the best places to walk. However, your dog can go just about anywhere you go as long as you pay attention to the walking surface and help him avoid hazards. If you partake in social media, it’s likely that you’ve seen the pictures of dogs with burned paws from walking on paved surfaces that are way too hot. Your dog’s paws are much tougher than human feet, but they still need protecting. If it’s too hot for you to be barefoot, it’s too hot for your pooch to be bare paws. Especially if you are walking on pavement or blacktop. If your pooch begins limping or licking his paws after a warm walk, check for potential burns. Warm days aren’t the only danger for unprotected paws. Winter months can bring their own potentially dangers. Trotting for long periods of time in ice or snow can lead to frostbite or discomfort. Before going inside with your canine companion, make sure to clean the snow, ice and dirt from their paws. If you don’t want to give up your long morning walks with Fido during extreme weather, consider investing in some stylish paw protection. Doggy snow booties help keep your dog’s paws warm and protects them from outside dangers. However, doggy footwear is not just for the snow. If you stop by your local pet supply store, you can find many options for doggy footwear. From thin paw covers that keep paws from picking up mud, to rugged doggy hiking boots, the options are endless. If you live in an area with few choices for doggy couture, you can find what you need online. When shopping for doggy boots, make sure you choose something that is as functional as it is stylish. But remember that your pup will need some time to adjust to wearing shoes. Most dogs don’t take to shoes right away. After a walk, hike or jog, it’s a good idea to inspect your dog’s paws for cuts, scrapes, or foreign objects. 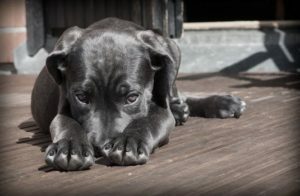 A small pebble or piece of broken glass can slide up between your pup’s paw pads and cause harm. Some dogs may not like their paws to be messed with, so disguise your inspection as a massage, with lots of praise to keep your dog from catching on. If you do see any issues, act quickly to keep small problems from turning into larger issues. Protecting your pooch’s paws is a great step to supporting their overall health. A good dietary supplement is another important step in promoting Fido’s health. An immune system building supplement can help keep all of your dog’s systems functioning properly. This includes his paws and bones. NuVet Plus is a great choice to support pet health. NuVet Plus is made from high-quality human grade ingredients, and has everything your dog’s body needs to function at it’s best. For more information, and to see what other pet parents have to say about NuVet Plus, visit nuvetreviews.com.